K. Nanbu, J. Phys. Soc. Jpn. 49, 2042 (1980). G. A. Bird, Molecular Gas Dynamics and the Direct Simulation of Gas Flows, Clarendon Press, Oxford (1994). G. A. Bird, Prog. Aeronaut. Astronaut. 74, 239 (1981). K. Koura and H. Matsumoto, Phys. Fluids A 3, 2459 (1991). C. Borgnakke and P. S. Larsen, J. Comput. Phys. 18, 405 (1975). B. L. Hass, D. B. Hash, G. A. Bird, F. E. Lumplin and H. A. Hassan, Phys. Fluids 6, 2191 (1994). I. D. Boyd, Phys. Fluids A 5, 2278 (1993). I. D. Boyd, Phys. Fluids A 2, 447 (1990). F. Bergemann and I. D. Boyd, Prog. Aeronaut. Astronaut. 158, 174 (1994). 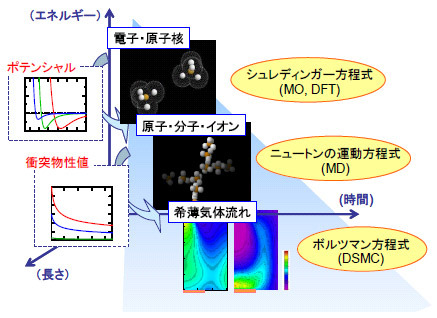 N. Yamanishi, Y. Matsumoto and K. Shobatake, Phys. Fluids 11, 3540 (1999). Y. Sakiyama, S. Takagi and Y. Matsumoto, Phys. Fluids 16, 1620 (2004). Y. Sakiyama, S. Takagi and Y. Matsumoto, J. Chem. Phys. 122, 234501 (2005). T. Tokumasu and Y. Matsumoto, Phys. Fluids 11, 1907 (1999).